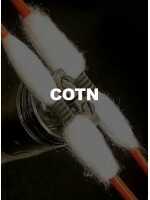 COTN Threads - 20 PiecesWant to be able to wick your RDA/RDTA in under a minute? Use COTN Threads! A..
COTN Pack - One LumpCOTN is a proprietary blend of fibers grown in the USA. Less waste, cut to ..